This homemade apple pie is flavorful, delicious, and easy to make! It’s the perfect pie to make for Thanksgiving or Christmas!! When making this pie it smells absolutely amazing in the house. The scent of nutmeg, cinnamon, and baking apples is absolutely wonderful! 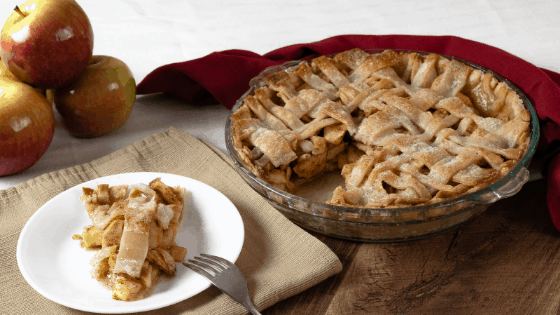 The trick to making the apples tender in this pie is to cut the apple into thin slices. This way, the apples are evenly baked and the flavors are evenly coated. You can make it easier on your self when it comes to thin out the crust but doing some of the work ahead of time. After mixing the ingredients and before placing it in the refridgerator, roll the crust into a disk and flatten out to about 3/4 to 1 inch before chilling. That way, when it comes out of the refridgerator, it’ll be easier to use a rolling pin and it will keep it’s shape. Do you want your pie to be moist and juicy for serving? If so, then simply add the apples to the pie filling mixture and add into the crust. If you prefer to have your bottom crust crisper and the pie not so juicy, place your apples into a skillet and simmer on low until the desired amount of juice comes out of the apples. I personally prefer to have some juice in the apple because it makes it more flavorful. It’s your pie, make it how you like it! This homemade apple pie is a favorite in our home and is perfect for Thanksgiving and Christmas. Combine flour, sugar, salt, cinnamon, and nutmeg in a bowl. Cut in shortening and butter until butter is broken down into small bits. Add in water, 2 tbsp at a time until no longer crumbly. Work crust with hands and roll into a ball. Separate into 2 balls, one larger than the other. The larger will be the bottom crust. Flatten out balls into a circular shape and place in the fridge for 20 minutes. Combine all dry ingredients and pour over apples. Mix apples and sugar mixture well to combine. Set Aside. Take pie crusts out of the fridge and roll thinly and place in pie dish. Pour apple filling into pie crust and even out. Roll out second pie crust and cut into strips if desired. Place over pie filling. Brush melted butter over top of the pie crust and sprinkle with sugar. Place aluminum foil around edges of pie and bake for 40 minutes. Remove aluminum foil from pie and bake for another 10-20 minutes or until the top of the pie is golden brown. This pie tastes scrumptious warm and is nice with a scoop or two of ice cream. Enjoy! Oh that looks delicious and sounds so simple that even I could do it! Ha. Thanks for sharing. I’m pinning this for apple picking season! Yum! Apple pie just might be the best thing about fall! Oh Mylanta that looks amazing. I’m pinning this to save for fall! Yum. Thank you for sharing! I can basically taste a warm slice of this with vanilla ice cream just by reading through the recipe! I’m not much of a pie baker, but I think this is one I need to try. oh i love apple pie! perfect time, i’m heading to the orchard this week!